Beverly's Official Blog | News and findings from world of crafts, scrapbooking and more: Another Gift Card Holder! 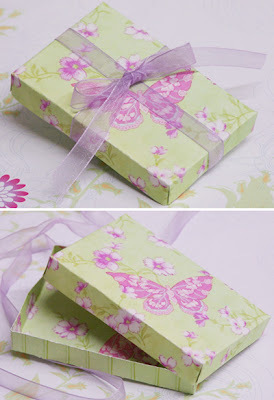 Here's a gift box to make - perfect for a gift card! And super easy to make with the Crafters Companion Top Score multiboard. 1. Cut two pieces of cardstock 3 1/2" x 4 3/4". HINT: I like my boxes to fit snug and since this is a tiny box I am making the top and bottom exactly the same for a tight fit. If you prefer a less snug fit you can use the same dimensions for the top, BUT score on the Box Lid edge of the scoreboard. 3. Fold in on all score lines. 4. With card in an up and down position, snip on the the left score line just up to the score line that is going across the card. Do the same on the right side of the card and then turn the card around and do the same on the 2 corners at the other end. 5. Put adhesive on each corner piece and glue inside to form a corner. 6. Repeat for all 4 corners on the top and bottom of box. 7. Put lid and bottom of box together and tie with a bow. This is a really cute box. Thanks for sharing the instructions.